If the newfound refinement, sharp styling or quiet and roomy interior don't grab you, perhaps the four-cylinder's 32-mpg highway fuel economy rating will. The car is 7.8 inches off the ground, so I don't recommend you go over big bumps larger than a speed bump. 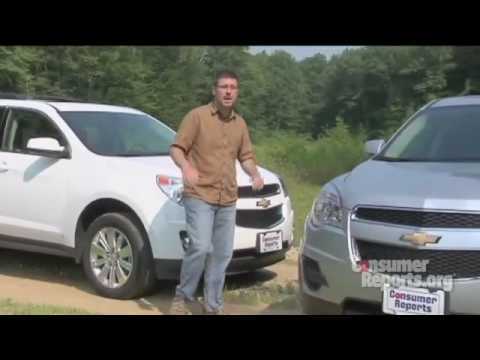 2010 Chevrolet Equinox lt2- reliable and beautiful. I own a 2010 Chevrolet Equinox lt2 in the color "cardinal red metallic". While my Equinox only has a four cylinder engine, it gets the job done when it comes to speeding up on the highways. Since it has a smaller engine, it has great gas mileage for its large size. I love that feature. Being the "lt2" model, my car has some extra features that the base models may not have, like a back-up camera, hands-free calling and Bluetooth, and chrome details on the exterior of the vehicle. The chrome is on my fog lamps, door handles, lining the windows, and on the side mirrors. It gives the car a more luxury look without the higher price. The interior is black, fabric seats, which is what I would always choose, even leather is available, so I am very happy with them. They still look beautiful and brand new, even 8 years later. Performance-wise the Equinox does everything I need it to. I do not do any off-roading nor do I live in a place where the weather is extreme, so the fact that it does not have 4-wheel drive, is irrelevant to me. I have not had any serious problems with my car except for it being called in for a recall a couple years ago. Of course, the dealership got me in as soon as they could and they fixed the problem. Overall, I adore my vehicle and I would recommend it to anybody. We have done little to no maintenance on it even though it has 128, 000 miles. We bought this vehicle brand new. It is by far the best car we have ever owned. We've had not big problems besides replacing tires and the battery a few times. It is roomy if your traveling or need to move big items. The lumbar drivers seat is great if you have back problems. However the driver's seat is uncomfortable on long rides. The backup mirror is wonderful and helps when backing out in parking lots. The only problem is if it has rained, it is hard to get a good view. The mirrors can be turned in when going through a drive thru. It gets approximately 27 miles on the highway. The roof rack is great if you need to carry extra luggage. However, we have never needs to use it. The air conditioner works ok but I wish the car had vents in the back since passengers have complained that it is warm back there. However, I would purchase an Equinox again.